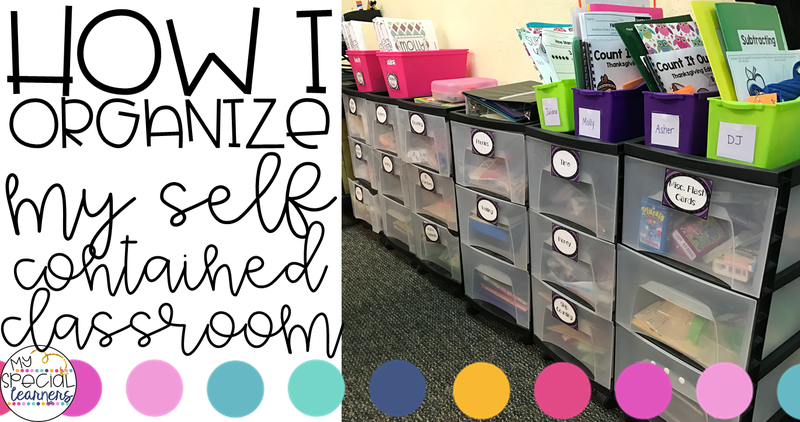 One of the most common questions almost every teacher wonders about one another is "How do they organize their classroom?!" (Or is this just me?!) I thought I'd show you all a few of the ways I organize materials in my (very tiny) classroom! This is my most used organized area in my classroom. I've shown pictures of this spot before and always get questions about it and honestly - I'm obsessed with it. It's literally just six rolling carts that I organize by academic area (things like money, time, skip counting, touchmath, abcs, phonics, etc!). It is a serious lifesaver. No searching around for certain flashcards or activities - my paras and I can all find things with ease! In front of the carts are two private work areas to work on IEP goals, so it makes it quick and easy to grab what you need when you pull a student. On top, I store worksheets that are goal specific for students who are using worksheets. 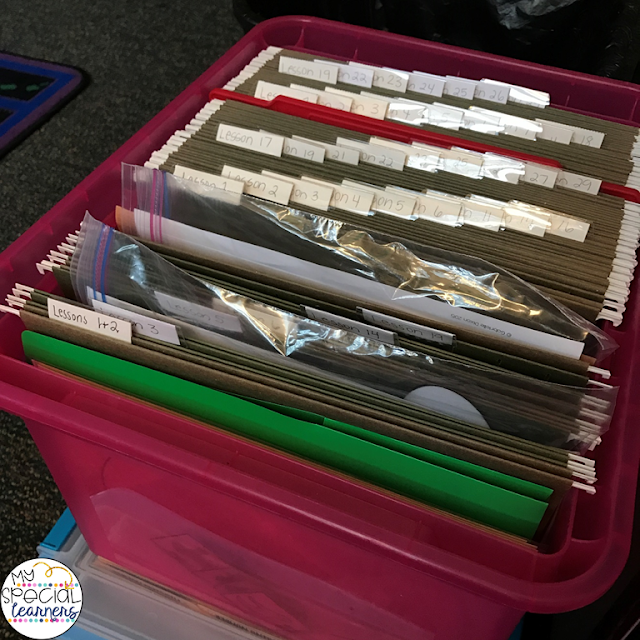 I also have two bins with data binders inside for each student's IEP data tracking. Everything in one place! This idea for storage I got from Gabrielle over at Teaching Special Thinkers (you can grab the labels for FREE in her TpT shop!). The tubs are from Target and each one holds two months (one label is on each side of the bin). Inside I store my seasonal worksheets, file folders, adapted books, and craft materials. Some of the bins are seriously bursting at the seams. This system makes my life so much easier at the start of a new month! I just put last month's away and grab everything out of the new bin! Inside I use hanging folders to keep everything organized and so it isn't flying around everywhere. This area of my classroom I store work materials like glue, markers, crayons, dry erase markers etc. We use shared supplies just to make things easier and it's great! These tubs are just from Dollar Tree and have lasted me like 3 or 4 years now! The last thing I do in my classroom is sort my classroom materials for the monthly Unique Learning Systems in a bin with hanging folders by day. In the front of the bin, I place a calendar with my month's activities on it so I can keep track of what I'm supposed to do each day with my group. I take the time at the beginning of the month to get everything printed and organized and it is ready to go each day! Hopefully you can take away a few of these ideas for your own classrooms! What are some ways you make your life a little easier with organization?! Is there a link to purchase the containers like the one with the file folders?